I am still reeling from what happened to me on Wednesday. I was planning on posting something fun and upbeat, but I'm glad that I forgot to hit publish because it certainly did not reflect how I have been feeling this entire week. Which is depressed mixture of anger, sadness, disappointment, and betrayal from my job which put a slight damper on my usually cheery home life. I have never had a job that made me choose between my personal life and work, but Wednesday, that was exactly the case. My district manager tried to talk me into staying to work for a new facility manager that is going to change my schedule around to the point where I would never get to see my husband, go to school, or have a weekend off ever. Her method? 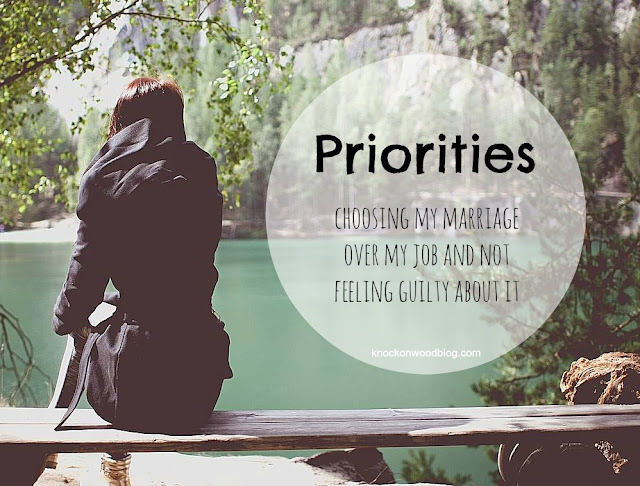 Giving me a guilt trip about me prioritizing my marriage over my job. In her exact words "You're really going to quit a job so you can see your husband seven nights a week? I work 12-16 hours a day and I have a husband and kids at home that I barely get to see, but that's the way it works in Health Care." My answer to her: "That is your life that you chose. It has nothing to do with my life and what I want from it." My job doesn't cook dinner for my family. My job doesn't cuddle up with me so I can go to sleep. My job doesn't make me tea when I am feeling sick. My job doesn't wake up at 2am to soothe a whining dog. My job doesn't clean my house. My job doesn't make a good snuggle buddy for watching movies. That's me, my husband, my pets, my family. And all of those things are so much more important to me than my job. After she left and my anger subsided a little, I began to just feel really sorry for her and her family. I feel sorry for her that she feels like she needs to put others down to feel powerful. I feel sorry for her family that she puts so much importance on her job that it takes her away from them so much. I feel sorry for her that she has a resting b*tch face and a bad attitude. And I feel sorry for all of the other facilities in her district that have to deal with her. I'm not worried though. I have another position lined up that will open up more doors for me and allow me to work hours that match my husbands. So for the next two weeks I'm going to take it easy and get my head back on straight. My husband is taking me to Branson, MO for Fourth of July Weekend and I start my new job the following Monday. But, I encourage everyone to take a stand for yourself and not to feel guilty that your want to attend all of your kid's soccer games or go with your spouse to doctors appointments or take your cat to the vet. And you should definitely NOT apologize to anyone for wanting to do these things. Life should be full of more good times than bad, and if your job is tipping that scale the wrong way, perhaps it's time to find a new one. Have you ever been pressured to choose between your family and your job? How did you handle it?